Key summer activities are trout fishing, horse riding and brumby watching, hiking and exploring the Snowy Hydro Scheme. In winter, Adaminaby is conveniently located near Mount Selwyn, an ideal budget family ski resort. Adaminaby is famous for trout fishing, both for the quality of the trout and the beauty of the locations in which they are found. Eucumbene Dam is situated some ten km to the nearest point at Old Adaminaby, with easy ramping facilities. The lake, though low at less than 30%, still has 4 times the water of Sydney Harbour. Mostly stocked with browns, it has a healhty population of native browns from their spawning in the Eucumbene River, above the lake, during the winter. The Eucumbene River is accessible at a number of spots above the lake. Providence Portal provides the closest spot, where the colder waters from Tantangara Dam join the Eucumbene – good in hotter weather. A few km further up the road, past Gang Gang Creek the main valley can be accessed and provides miles of good fishing. Across the first range, round Kiama the Eucumbene meanders through the high country. The cold water meant the fish are active in the hotter months and the scenery is fantastic through the old gold country – watch for wild brumbies! The Murrumbidgee River has some great fishing, although access is more of a problem. In most cases you will need to approach the land owner for access, but the results can be well worth the effort. Tantangara Dam, some 25 km off the Snowy Mountains Highway before Provedence, provides an interesting trip for the keener angler, with good fishing in the right conditions. At time of writing, levels were particularly high, providing a much larger than usual dam – not a lot smaller than Jindabyne, with much less competition. Lake Jindabyne is a further drive but is well stocked with rainbows, browns and Atlantic salmon. Both lakes are excellent for boat fishing and the cottage has good off street parking for boats. The rivers to the East of Jindabyne have been famous over the years, but the recent long drought has not been konk to some of them. The exception would be the Tredbo, accessible at a number of good places up the valley and the Snowy through from Guthega to Island bend. Whilst the rivers in the Jindabyne region would make a good day trip, there is more than enough in the Adaminaby region to satisfy, usually with less competition! Adaminaby is a favorite destination for Canberra people looking for a quiet retreat for a few days. It is an ideal town to just rest and relax in the summer with the milder temperatures. Glendaruel is fully self-contained with an excellent kitchen, should you not want to go out, but the town has a number of value-for-money eateries, should you feel like it. 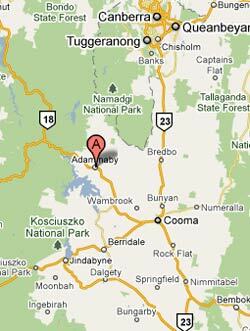 As well as the route through Cooma, Adaminaby can be reached through Tharwa and the Bobeyan Road through the Namadgi National Park. This provides an exciting short cut, so long as you observe the road conditions. Discovered in 1834, the Yarrangobilly Caves are a series of limestone caves with a fascinating geological history. There is also a warm thermal pool. The Caves have been a favourite for visitors since the 1890. Considering how remote they must have been then, they must have held a real fascination for visitors from the earliest days. The Caves make a facinating day tour from Adaminaby – a very scenic 40km drive up the Range. There is a NPWS Shot and the historic Yarrongobilly Guesthouse and excellent picnic facilities. If you are fishing, hiking or horse riding it provides a great option if the weather turns. Well worth a visit! The Adaminaby district is the home of many of the legends of both horses, riders and brumbies made famous by Banjo Patterson & less well known but very strong ties to the District, Barcroft Boake. The high country provides some fantastic saddle treks and Adaminaby has some of the best. There several local companies providing full horse riding services at every level of experience. The area also has some great spots to see the wild brumbies that make the high country their home. There are many hundred kms of breathtaking walking tracks across all of the Snowy Mountains. For the keen walker, we can provide a drop off and pick-up service, across the whold district. We should point out that most of the high country tracks are not for the inexperienced or the unfit.